If you are using the Skype software to make video calls, you may have noticed that it does not offer options to customize the video output on your machine. Skype enables HD video only on computer systems that match certain requirements. If your system does not meet those requirements or if Skype identified the hardware incorrectly, you may be left with SD video only. This could also be useful if you notice slow downs or even freezes when you are using Skype video telephony on a computer system. Skype requires Internet connections that support a minimum of 1.2 Mbps in both directions for HD video calling. Force Skype HD Video is a free program for the Windows operating system that provides you with the means to customize Skype's video settings. Note: The program requires the Microsoft .Net Framework 3.5 SP1. After you have installed the application and started it up, it displays all available Skype accounts on the system in its interface. There you can select one, some or all of them to use one of the quick video profile settings listed below. Enable HDTV Video setting which enables a video calling resolution of 980x720. 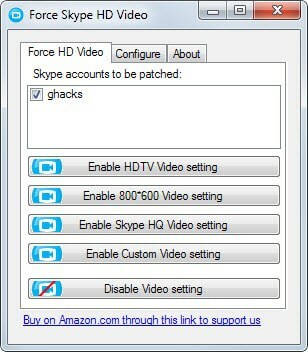 Enable Skype HQ Video setting which enables a 640x480 video calling resolution. The custom video setting button applies the values that you can customize under the configure tab. Here you can modify the width and height of the video calling screen as well as the desired frames per second. The option to set the custom resolution did not work properly during tests. While I was able to set a custom resolution and save it, a click on the custom video setting button would always set the resolution to 320x240 instead, the default value. If you use Skype video calling and experience issues while using it or want to modify the video output on your end, then you find that this program helps you with that. It is easy to use and allows you to enable or disable HD video while using Skype. Wondering why people still use skype. After all the spying, source leak and such. I’m using ooVoo or GTalk xmpp and Jitsi.